To seventeen-year-old Angie, who is mixed-race, Marilyn is her hardworking, devoted, white single mother. But Marilyn was once young, too. When Marilyn was seventeen, she fell in love with Angie's father. 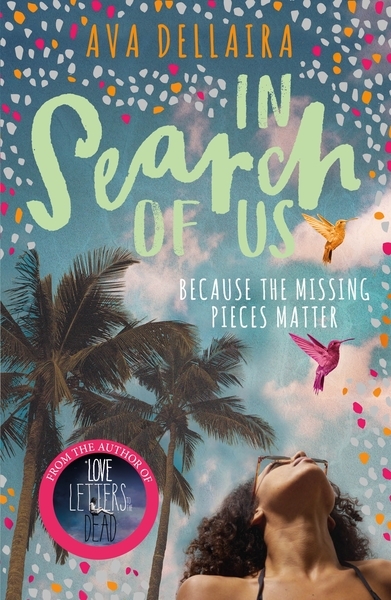 In Search of Us tells two parallel stories, of a mother and daughter, and of love and trauma that span generations. The first story follows Angie, a seventeen-year-old, mixed-race girl who has always believed that her father, James, died before she was born. Until she finds out that her mother, Marilyn, lied about James's brother also being dead. With the news that Angie's uncle is still alive and living in LA, Angie doesn't know if she can believe what Marilyn tells her anymore, so she enlists the help of her ex-boyfriend, Sam, to drive her to LA so she can find out the truth about her family, and possibly find the father she never got to meet. The second story follows Angie's mother, Marilyn, before she was Angie's mother, when she was seventeen, and her own mother, so determined for Marilyn to succeed, moved the two of them in with Marilyn's uncle in LA. All Marilyn wants is to get out of LA and leave her acting career and her alcoholic uncle behind. Until she becomes friends with the boy who lives in the apartment below her uncle's, James, Angie's dad. Marilyn falls in love, not only with James, but with his whole family, who make her feel at home in a way her own family never has, and over one summer Marilyn falls in love and begins to set out and choose her own path. In alternate chapters we see Angie desperately search for the uncle who might lead her to the father she no longer believes is dead, and learn why Marilyn kept the summer she spent with James a secret from her daughter. Both girls are searching for different things. Angie, for a father who she can talk to about her African-American heritage in a way she can't with Marilyn and who can alleviate the difficulties she faces as the black daughter of a white woman. Marilyn, simply for an escape from her controlling mother, trying to live her dreams through her daughter at Marilyn's expense, and her volatile uncle who tries to forbid her from seeing James. Angie and Marilyn's stories are both full of longing and desperation, one looking to get away from a family and the other looking to find one. Although the two stories are different, they weave together to eventually reveal the truth of what happened to James, and for both girls to learn what they need to carry on. The writing is vivid and beautiful, bringing to life both the LA setting and the characters' emotions in a way that is easy to get lost in. Personally, I thought James and Marilyn's love story was the most engrossing of the two, but neither story can really exist without the other, just as Marilyn and Angie would not exist as they are without each other. This is a beautiful and heartbreaking story about the things we unwittingly pass down through generations, and I highly recommend it. Anastasia is an English and Creative Writing graduate and aspiring writer. She spends most of her time trying to pass off reading books and watching films as research for her many works in progress but occasionally she also remembers to blog at Anastasia Gammon.